The Sub It Club welcomes Russ Cox this month. If you haven’t come across Russ’s illustrations before, you’re in for a treat. Let’s find out about Russ and his latest postcard. RUSS COX was raised by a pack of crazed hillbillies in the backwoods of Tennessee. Without much in the way of modern conveniences, like a television set or running water, he spent his time drawing away the hours. After dismantling his grandfather’s lawn mower engine, and without a clue on how to get it back together, he realized that he did not have an automotive bone in his body so he kept drawing. After graduating from art school, with a portfolio in hand, he ventured into the world of design and illustration. He opened his own studio, Smiling Otis Studio, where he presently specializes in illustration for children. When not drawing, running amok in the snow, or training his four cats to sing Bohemian Rhapsody, Russ enjoys some quiet time, working on his picture book stories. He also enjoys playing the banjo but his wife would prefer him to play the triangle or build a soundproof room. How do you choose the image(s) for a postcard? The first thing I make sure is that the image is telling enough of a story that the viewer would like to see more. * I then continue it on the back with a simple black and white illustration. The other thing I look for is making sure the images are strong enough in character development. *You’ve definitely got me wanting more with this one. I’m closing my eyes until you say that octopus is nice. The first sketch for the new postcard. Second and third sketches. Oh yeah! I see character and story development. 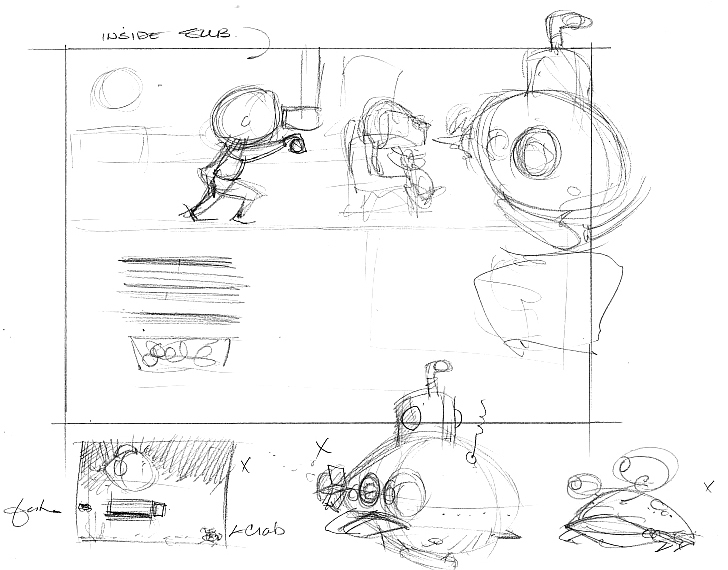 Fourth and fifth sketches. Ack! Things are really getting out of hand, I mean, tentacle now. Do you prefer text on the front of the postcard with the image or do you prefer all text on the back of the postcard? I put my name, phone number, and email address on the front so it is easy to contact me without having to take the postcard down if the art director has it hanging up. * The rest of my info goes on the back. *You’ve done a great job of putting type on the front and making it visible without overwhelming the image at all. Do you create illustrations specifically for your self-promotion pieces? I do. I like the idea of showing something fresh and current. Plus a lot of time, I can’t use any images until the book is out which could take a year or more. Some illustrators create a series of postcards and send them out over time. Do you create a series or stand-alone images? I do stand-alone postcards. For me it’s about keeping things fresh and new so each card is different. I think it allows you to show how you are developing your style and give the art director or publisher a taste of a new story idea. How often do you send out postcards? *3 mailings a year is pretty darn good. Who do you target with your mailings? 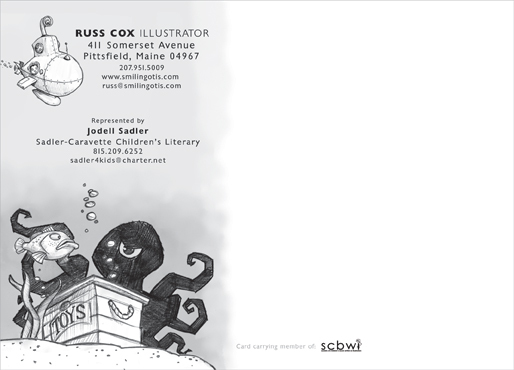 Since I landed an agent this year*, my mailings are now focused on publishers, agents, art directors, etc. I also try to send a postcard to magazines, game companies, and any other client that I find interesting. *I love how you slipped that in there, Russ–but seriously, that deserves an ALL CAPS shout-out! Congrats on the agent landing! Do you have any tips on the production process? I use Photoshop for tweaking my images and use Illustrator for my layouts. I find it easier to manipulate fonts if I need to do so. My images are 300 dpi and saved as eps files that are imported into Illustrator. My postcard printing is done by OvernightPrints so I export the final files as tiffs and then double check the colors in Photoshop. Do you use any online services? What are your favorite places to get postcards printed? Again, I use OvernightPrints for my cards and have had great results with them. I know other illustrators who use Vista Prints and Modern Postcards. Click on the links below to find out more about Russ and his illustration work. This has been so much fun. Thanks for sharing your tips, sketches and beautiful postcard, Russ! And let me know about the octopus– this is hard to do with my eyes closed. If you’re joining us for the first time at the Monthly Postcard Post, you can catch up with a general article on postcard mailings for illustrators and previous featured illustrators in the archive (there’s a tab above too). See you next month. Thank you Dana for the interview and the swell comments you added. You’re welcome, Russ. Thanks for doing it. Love your postcard! Terrific post! I love Russ’s art and he’s put a lot of thought into creating a postcard which will be his introduction to art directors and possibly others who might hire him. Congrats on your agent, Russ! Hi Dana, I noticed your SCBWI connection and wondered if I had met you. That was my first International conference, so I was a bit scattered. If you will be there in August, hope to see you again. 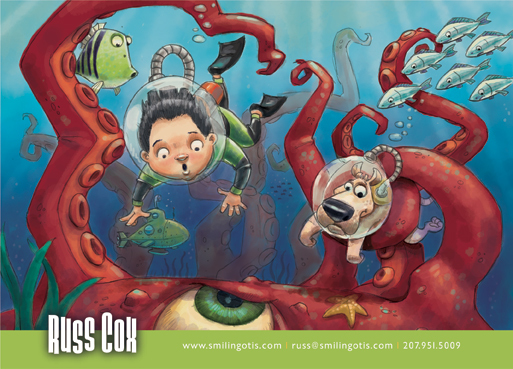 Check out Thursday night #kidlitart chats to hear more from Russ. That’s where I first saw his work. He’s great! Thanks so much for your comment, Joanne. I’m so glad you like the Postcard Post because I love doing it. I learn a lot with each interview. Plus it’s just so helpful to see what other illustrators are sending out. Thank you to everyone for the kind words. I appreciate you taking the time to read the interview and for Dana, asking me to be part of the Postcard Post. All of you made my day.